Vinyl fencing systems accent your home and enhance your property value with incomparable style and uncompromising quality. 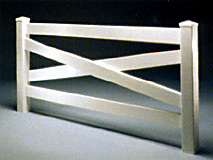 Vinyl fencing systems are uniquely designed to offer durability and practicality. But the real beauty is that it requires virtually no upkeep. Our 3- and 4-rail fencing provides sturdy construction and long-lasting quality to create low maintenance enclosures for horses and livestock. Additional styles (not suitable for animal containment) are available that can also beautify and enhance the value of your property. 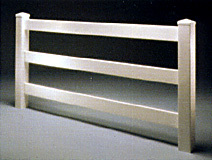 Contact Metro Fence for color availablity. 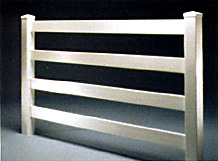 2 Rail is ideal for stately perimeter applications. 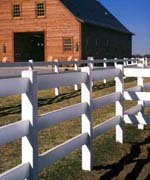 3 Rail is the choice for typical horse pasture applications. 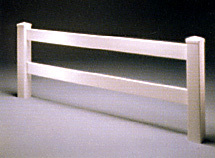 4-Rail is available for applications where taller fence and smaller rail spacing is desired. Classic Crossbuck style has distinctive design. 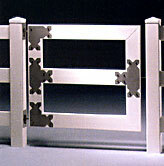 Diamond rail is available in 2 or 3 rail style only.